Lorex Security Cameras: Advantages, Disadvantages, etc. 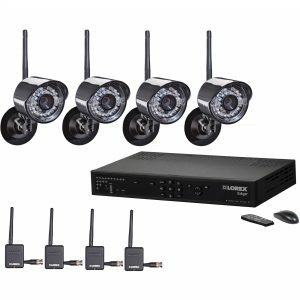 Is a Lorex Security Camera System Hard to Install? This question isn’t easy to give one single answer to. The answer is, “it depends!” Keep on reading. There’s advice for the DIY King or Queen, those who are moderately handy, and people who don’t even own a hammer. A DIY King or Queen? If you’re a handyman or handywoman that’s decent with technology, it won’t be hard for you at all! Get out your drill, make a few holes, put those cameras up and hook up the wires. Then set up the computer end of things. Your Lorex security system will be up and running in no time. Moderately Handy with the Tools? If you consider yourself moderately handy, then with a bit of help (reading the instructions/watching recommend videos/tech support), you should be able to do it easily enough. Lorex says that they design their security systems to be DIY friendly. Many people are able to get Lorex home security systems up and running in only a couple of hours. Don’t Even Own a Hammer? However, maybe you’re not that handy, nor are you good at computer stuff. In this case, you’ll likely find it very difficult. In this case, we recommend hiring a company to help you. You can search on Google for: security camera installation (city you live in). For example: security camera installation Vancouver. Call a few places and compare prices. Of course, always check reviews online. What Tools do I Need to Install a Lorex Camera System? The most basic thing you’ll need to install security cameras is a drill. The size and strength of the drill will depend on the exterior of your house. See this example where a guy installed Lorex security cameras on his brick walls. Installation at your house may be easier than this, depending on the material on your wall. If you need to buy a drill, go to a place like Home Depot. Ask what they recommend for your specific situation. You should also have a few screwdrivers handy during the installation process. Where to Install Lorex Security Cameras? How do you actually go about installing Lorex Security Cameras? The good news is that the instruction manual that comes along with your system is quite good. It’s complete with step by step instructions and lots of pictures. 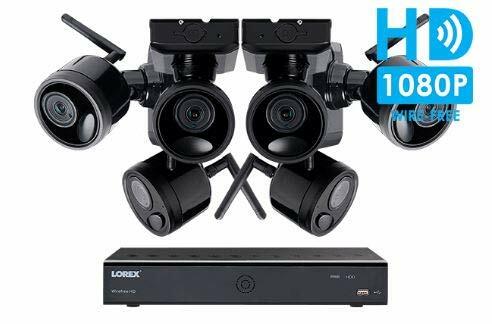 Check out their website for a brief overview of the process: How to Install Lorex Security Cameras. It really is not so difficult to protect your home or business with Lorex. How do I Connect my Camera to the Receiver? Okay, so you’ve successfully mounted your cameras and have them all hooked up to power. Now, how do you connect the camera up to the recorder (NVR or DVR)? It depends on what type you have. Here are some brief guidelines. Be sure to follow the instructions that come with your specific camera. One RG59 siamese BNC cable connects the camera, power and DVR. This single cable provides both power and video transmission. The video head of the cable plugs into the DVR while the power head connects to the power adaptor. Some NVR systems utilize Power-over-ethernet technology that requires only a single Ethernet cable to connect the camera and recorder. You connect the cable into the back of the NVR and the camera, and it’ll provide both power and video transmission. This is one of the easiest options because you don’t have to run cable through buildings or underground. You can also change camera location quite easily. You just have to connect the camera to a power outlet, and it then connects wirelessly to the DVR. The good news is that you don’t need a Wi-Fi connection, unless you want to access the footage remotely. What if I Want to Extend the Range of my Camera? If you want your camera to be further than the receiver, there are a few things you can do, depending on what type of camera you have. It’s not so uncommon to want to do this for your business, for example a large plant or factory. Instead of setting up multiple camera systems, you’ll want to have a single monitoring station. Analog cameras can be up to 800 ft away—you just need a longer cable. PoE cameras can be extended by using a PoE switch. Finally, wireless cameras can be placed further away by using a wireless range extender. How do I Set-Up Remote Video Access for Lorex Cameras? Make a Lorex DDNS account to create a permanent web address for your security system. Connect to your system remotely via the Internet. Learn more here: How do I Access Lorex Security Systems Remotely via Smartphone? What if I Need Help Installing my Lorex Camera? If you run into trouble while installation your Lorex Camera, the company has a technical department that you can call. The number is: 1-877-755-6739. It’s open from 9am-10pm Monday-Saturday. You can also submit a support ticket and get some help via email. They specialize in offering solutions for your digital products so please contact them for help if necessary. Chances are, they’re dealt with your problem numerous times—there are very few new ones! Not Sure Which Lorex Security Camera is for You? Check out the chart below for a brief overview of your options and prices. Question or Comments about How to Install Lorex Security Cameras? Leave a comment below and let us know if we didn’t answer your question. We’ll do our best to help you out. Any tips on Lorex installation for other people reading this article? Also be sure to give this article a share on Facebook, Twitter, or Pinterest. Thanks so much for your tips for installing Lorex cameras. We got stuck at how to link up the cameras to our computer, but figured it out eventually. I got stuck part-way through installing my Lorex system. Thanks for the helpful tips and videos. I’ve been thinking about pulling the trigger on a Lorex system, but I’ve wondering if they’re really DIY. Thanks for the confidence I needed to just go for it and figure it out! I’m wondering exactly how easy Lorex Cameras are to install. I’m not exactly handy, and don’t even own a drill. Ha! Thanks for the tips about installing Lorex Cameras. I was struggling a little bit with it, but your article, along with YouTube videos solved my problem. I just went through this process and wanted to let everyone know that it’s not actually that difficult to install Lorex cameras. Seriously. I put four of mine up, and got them all connected to the DVR in just a few hours.